Sus comentarios «sobre temas de vigilancia y separación de poderes» han sido citados en The New York Times, en The Washington Post y en los debates del Senado de los Estados Unidos, y en informes del Congreso sobre «abusos del poder ejecutivo».​ Greenwald aparece en varios programas de radio y televisión como invitado experto en temas políticos. Greenwald ha escrito cuatro libros, tres de los cuales aparecieron en la lista de bestsellers del New York Times: How Would a Patriot Act? (2006); A Tragic Legacy (2007), y With Liberty and Justice for Some: How the Law Is Used to Destroy Equality and Protect the Powerful, publicado en octubre de 2011. Su cuarto libro fue Great American Hypocrites publicado en 2008. No Place to Hide: Edward Snowden, the NSA, and the U.S. Surveillance State. Metropolitan Books. ISBN 1-6277-9073-X. ISBN 978-1-62779-073-4. How Would a Patriot Act? Defending American Values From A President Run Amok. San Francisco: Working Assets, 2006. ISBN 0-9779440-0-X. A Tragic Legacy: How a Good vs. Evil Mentality Destroyed the Bush Presidency. New York: Crown Publishing Group, 2007. ISBN 0-307-35419-9. With Liberty and Justice for Some: How the Law Is Used to Destroy Equality and Protect the Powerful. Metropolitan Books, 2011. ISBN 0-8050-9205-6. ↑ Greenwald, Glenn (19 de julio de 2012). "Glenn Greenwald Moves From Salon to Guardian U.S.". New York Times. Consultado el 21 de julio de 2012. ↑ Greenwald, Glenn (19 de julio de 2012). "I'll be writing in a new venue beginning next month". Salon.com. Consultado el 21 de julio de 2012. ↑ Greenwald, Glenn (14-12-2011). "Bradley Manning deserves a medal". The Guardian. ↑ Greenwald, Glenn (21-07-2011). "Barack Obama is gutting the core principles of the Democratic party". The Guardian. ↑ Greenwald, Glenn (07-10-2011). "The CIA's impunity on 'torture tapes'". The Guardian (London). ↑ Greenwald, Glenn. "Edward Snowden: the whistleblower behind the NSA surveillance revelations", The Guardian, 9 de junio de 2013. Consultado el 21 de julio de 2013 (en inglés). ↑ "Edward Snowden comes forward as source of NSA leaks", The Washington Post, 9 de junio de 2013. Consultado el 10 de junio de 2013 (en inglés). ↑ a b c d e "Glenn Greenwald". Salon.com. Consultado el 24 de agosto de 2012. ↑ "When Bonus Contracts Can Be Broken". The New York Times. 17-03-2009. ↑ "Bush's final days". Los Angeles Times. 14-01-2009. ↑ Greenwald, Glenn (14 de diciembre de 2011). «Bradley Manning deserves a medal». The Guardian (London). ↑ Greenwald, Glenn (21 de julio de 2011). «Barack Obama is gutting the core principles of the Democratic party». The Guardian (London). ↑ Greenwald, Glenn (7 de octubre de 2011). «The CIA's impunity on 'torture tapes'». The Guardian (London). ↑ «Author Search: Glenn Greenwald». The American Conservative. Consultado el 14 de diciembre de 2008. ↑ Greenwald, Glenn (25 de abril de 2008). «The Perilous Punditocracy». The National Interest. The Nixon Center. Consultado el 14 de diciembre de 2008. ↑ Greenwald, Glenn (21 de julio de 2006). «Author Profile:Glenn Greenwald». Consultado el 14 de diciembre de 2008. ↑ a b Greenwald, Glenn (21 de julio de 2006). «Rechecking the Balance of Powers». In These Times 30 (8). Consultado el 14 de diciembre de 2008. ↑ «Glenn Greenwald». Speakers' Biographies (Stand Up For Freedom: 2008 ACLU Membership Conference). ACLU. 8 de junio de 2008. Archivado desde el original el 21 de diciembre de 2011. Consultado el 14 de agosto de 2012. ↑ a b Cristina F. Pereda, "«The Guardian» y el «Post» ganan el Pulitzer por las revelaciones de Snowden", El País, 14 de abril de 2014. ↑ a b "Este premio es para Snowden": Greenwald y Poitras reciben el Premio Polk por denunciar la vigilancia de la NSA, Democracy Now!, 11 de abril de 2014. ↑ Stein, Gary (13 de marzo de 1985). «At 18, Future Holds Promise». Sun Sentinel. ↑ a b c d Greenwald, Glenn (20 de julio de 2006). «Response to Right-wing Personal Attacks: My Law Practice; My Sexual Orientation; Where I Live». Unclaimed Territory. Consultado el 24 de agosto de 2012. ↑ Neil A. Lewis (6-03-2007) "Libby Guilty of Lying in C.I.A. Leak Case". The New York Times. Consultado el 21 de julio de 2013. ↑ James Risen y Eric Lichtblau (16-12-2005)"Bush Lets U.S. Spy on Callers Without Courts". The New York Times. Consultado el 21 de julio de 2013. ↑ Byers, Dylan (19 de julio de 2012). "Glenn Greenwald to move to The Guardian". Politico. Consultado el 21 de julio de 2012. ↑ Greenwald, Glenn; Ewen MacAskill; Spencer Ackerman (5 de junio de 2013). "NSA collecting phone records of millions of Verizon customers daily". The Guardian. Consultado el 21 de julio de 2013. ↑ "NSA leaks journalist Glenn Greenwald leaves the Guardian", BBC News, 16 de octubre de 2013. ↑ Mark Hosenball, "Here's Who's Backing Glenn Greenwald's New Website", The Huffington Post, 16 de octubre de 2013. ↑ Russell, Jon (10 de febrero de 2014). "The Intercept, the first online publication from eBay founder Pierre Omidyar, is now live". The Next Web. Consultado el 21 de febrero de 2014. ↑ a b The Intercept, "About The Intercept", FirstLook.org/theintercept, The Intercept, 10-02-2014. Consultado el 21 de febrero de 2014. ↑ "No Place to Hide - Glenn Greenwald - Macmillan". macmillan.com. Macmillan Publishers. Consultado el 17 de mayo de 2014. ↑ Prachi Gupta, «Glenn Greenwald to write book on NSA and Edward Snowden- The Guardian journalist who broke the story will share "new revelations" in a book coming March 2014», Salon.com, 18 de julio de 2013. Consultado el 20 de diciembre de 2013. ↑ a b c d Peter Maass (18 de agosto de 2013), How Laura Poitras Helped Snowden Spill His Secrets The New York Times. Versión en español. Consultado el 20 de diciembre de 2013. ↑ Carmon, Irin (10 de junio de 2013). "How we broke the NSA story". Salon.com. Consultado el 20 de diciembre de 2013. ↑ U.S. filmmaker repeatedly detained at border. Salon.com (08-04-2012). Consultado el 20 de diciembre de 2013. ↑ Weinger, Mackenzie (10 de junio de 2013). "Barton Gellman, Glenn Greenwald feud over NSA leaker". Politico. Consultado el 20 de diciembre de 2013. ↑ [http://internacional.elpais.com/internacional/2013/08/18/actualidad/1376858025_990675.html Londres retiene nueve horas al novio del periodista que destapó el «caso Snowden». El País. 19 de agosto de 2013. Consultado el 19 de agosto de 2013. ↑ Glenn Greenwald: detaining my partner was a failed attempt at intimidation. The Guardian. 19 de agosto de 2013. Consultado el 19 de agosto de 2013. ↑ Savage, Charlie; Michael Schwirtz (2013-08-18). "Britain Detains Partner of Reporter Tied to Leaks". The New York Times. Consultado el 19 de agosto de 2013. ↑ "Greenwald diz que espionagem dá vantagens comerciais e industriais aos Estados Unidos" (en portugués). Senado Federal de Brasil. Consultado el 20 de diciembre de 2013. ↑ "Greenwald to MEPs: governments around the world benefit from Snowden's choice". European Parliament. Consultado el 20 de diciembre de 2013. ↑ a b "Greenwald: UK poses 'primary threat' to EU citizens' privacy". Channel 4. Consultado el 20 de diciembre de 2013. ↑ Art of The Possible (16 de enero de 2006). «Interview with Glenn Greenwald». Art of the Possible Blog. Archivado desde el original el 26 de noviembre de 2015. Consultado el 24 de agosto de 2012. ↑ Greenwald, Glenn (14-12-2010). "Attempts to prosecute WikiLeaks endanger press freedoms". Salon.com. Consultado el 24 de agosto de 2012. ↑ a b c Greenwald, Glenn. «Preface». How Would a Patriot Act?. San Francisco: Working Assets, 2006. pp. 1-2. Archivado desde el original el 27 de septiembre de 2007. Consultado el 24 de agosto de 2012. ↑ Silverstein, Ken (21-02-2008). "Six Questions for Glenn Greenwald on Campaign Coverage". Harper's Magazine. Consultado el 24-08-2012. ↑ Goodman, Amy (22-07-2009). "Obama Adviser Cass Sunstein Debates Glenn Greenwald" (transcripción y MP3 audio clip). Democracy Now!. Pacifica Radio. Consultado el 24-08-2012. ↑ Greenwald, Glenn (16 de enero de 2006). «Bush Followers Are Not Conservatives». Unclaimed Territory Blog. Consultado el 24 de agosto de 2012. ↑ Baker, Peter (12-08-2008). "Liberals Wonder When Obama's Team Will Reflect Them". The New York Times. Consultado el 24 de agosto de 2012. ↑ Wallace-Wells, Benjamin (13-05-2010). "Cass Sunstein Wants to Nudge Us". The New York Times. Consultado el 24 de agosto de 2012. ↑ Szalavitz, Maia (26 de abril de 2009). «Drugs in Portugal: Did Decriminalization Work?». TIME. Consultado el 24 de agosto de 2012. ↑ Greenwald, Glenn (03-07-2011). "Civil liberties under Obama". International Socialist Organization. Consultado el 24 de agosto de 2012. ↑ "Amnesty International condemns ‘inhumane’ treatment of Bradley Manning". The Raw Story. Raw Story. 24-01-2011. Consultado el 21 de julio de 2013. ↑ Greenwald, Glenn (18-06-2010). "The strange and consequential case of Bradley Manning, Adrian Lamo and WikiLeaks". Salon.com. Consultado el 21 de julio de 2013. ↑ "Glenn Greenwald And Amy Goodman Share Inaugural Izzy Award For Independent Media". Ithaca News Release. Ithaca College. 5 de marzo de 2009. ↑ «Online Journalism Awards, 2010». Online Journalism Awards. 31 de octubre de 2010. Consultado el 24 de agosto de 2012. ↑ Boadle, Anthony (6 de agosto de 2013). "Glenn Greenwald: Snowden Gave Me 15-20,000 Classified Documents". Huffington Post. Consultado el 13 de diciembre de 2013. ↑ «Copia archivada». Archivado desde el original el 20 de junio de 2014. Consultado el 29 de junio de 2014. 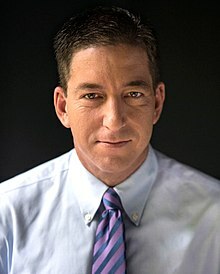 Wikimedia Commons alberga una categoría multimedia sobre Glenn Greenwald. Gleen Greenwald - Columnas en The Guardian. "Glenn Greenwald" – Columnas de Glenn Greenwald y blog en Salon.com. Esta página se editó por última vez el 20 mar 2019 a las 22:57.